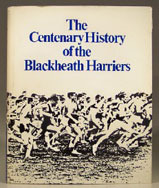 #7954 - The Centenary History of the Blackheath Harriers 1869-1969 - Saunders, D.K. & Weeks-Pearson A.J. Wadard Books Online | Sports & Pastimes | #7954 - The Centenary History of the Blackheath Harriers 1869-1969 - Saunders, D.K. & Weeks-Pearson A.J.